Ben and Mena Trott are here, visiting Seabury as part of our technology lecture series. They gave a spectacular workshop talk this afternoon for a gathering of students, stimulating their imaginations about the potential of personal publishing beyond anything they’d dreamed before. They joined Trevor and Margaret (and Pippa) and me for dinner at Cozy Noodle, and now are beginning their evening presentation at Seabury. Three Seabury students are surrounded by a sea of Chicago-area bloggers who came out to show their appreciation for Ben and Mena. I’m live-blogging from the back of the room. They’re beginning with a quick overview of Movable Type’s new version, and pointing us to sites that use MT without it necessarily being obvious that MT is behind the scenes. First, the Urban School of San Francisco; they use MT not so much as a blog, but uses MT for content management by calling on categories. The Urban School uses the standard MT calendar to power an event calendar (! ), filtered by type of event. Second, they point us to the 826 Valencia, a writing center and pirate store in San Francisco. 826 Valencia actually gets their students writing; they sent a student to NYU, I believe, who continues to blog on the site (demonstrating to current students that there can be a benefit to the work of learning writing skills). Third, they point to a site that aggregates TrackBack feeds from a number of disparate individual blogs, AustinBloggers. This site collects TrackBack pings from separate individuals’ blogs, and compiles them into the Austin Bloggers page (they do mention Topic Exchange, Liz). Ben and Mena suggest that Seabury could use this schema to compile entries from individual blogs, into a shared meta-blog (as it were). They mocked-up a Seabury version of one of these, based on Trevor’s ethics class blog. Now they’re discussing helper applications, such as NetNewsWire Pro and Kung-Log (on OS X), or w.bloggar or NewsGator (on Windows). It’s hard to overstate their enthusiasm for NetNewsWire and Kung-Log. . . .
Now they’re talking about the upcoming release of Moveable Type Pro. Among the upcoming features are a photo album tool, differentiation of editors from authors, custom entry fields, registration for Comments and Posting, and hierarchized categories. Questions? 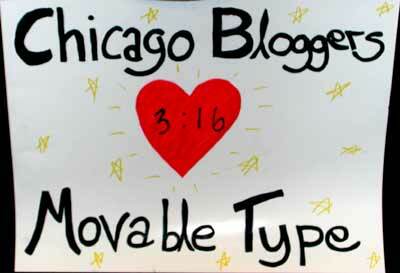 A Chicago blogger asked whether there were any alternatives to the word “blog”? Ben and Mena don’t like the word, but they don’t see an effective alternative. Better support for Windows installations? Ben says “some.” One user had a firewall problem. Will the moblog feature be available on future releases? Mena notes that some features are very hard to implement at each specific server location. They’ve had blog-by-email ready for ten months, but the haven’t released it because it requires too much customization. Alex asks about the effect of weblogging software on social groups who meet face-to-face regularly. Mena notes first of all the the Chicago Bloggers are out in force tonight — weblogs brought a couple dozen people to Seabury tonight who would never have been here otherwise, who knew one another in the face-to-face world. Blogging in academic settings brings together self-expression by writing with interpersonal interaction. Ben mentions the different perspectives one gains from reading various accounts of, for instance, a conference. Mena notes that when Ben blogs during their vacations, she reads his blog to find out what he really thinks. I missed some questions about marketing, hype, blogs, Raging Cow, and the future. I was busy putting the brownies and molasses cookies out. I’ll ask Liz’s question (from the comments): “Can you convince Ben & Mena to create “Movable Course” software? 🙂 Or to let us turn it into that?” Ben says it’s an interesting direction, and allows that they will in fact be looking at other applications for their software. They had built an education portal at their previous workplace. They know there’s a big market; maybe, but Mena doesn’t think it’s in the immediate future. Will Moveable Type Pro eclipse any free versions, or will there be a free version alongside MT Pro? Mena says that they will always keep a free version along with the Pro version, but will also allow the incentive of a more powerful version for those who are willing to contribute. They note that they’ve done very well from donations, that their donors have been very generous. What are their favorite blogs? Boing Boing — they don’t specify any others. Have they met them all? They’ve met the authors of about half of their favorite blogs. Most of the bloggers they read go to tech conferences, where they meet. What’s the timing on their release cycles? Mena’s telling funny stories about the release of the first version. Cinnamon had made a lovely hand-sewn handbag for Mena; Alex announced the Digital Genres Conference (Sidebar comment by Alex: “Being an anonymous blogger is like being a serial killer; you really want people to know”); the audience consumed home-baked brownies and molasses cookies from Margaret; and the CBs decamped with Ben and Mena for a local pub. I stayed, stacked chairs, and tried to calculate whether I really am old enough to be their father. A splendid evening! Ahhhhh…excellent. I’ve been thinking a lot about Movable Type as an underlying engine for CMS. It get back to my interest in better courseware. Can you convince Ben & Mena to create “Movable Course” software? 🙂 Or to let us turn it into that? you’re obviously much more proficient at note taking than myself 🙂 nice turnout. fun time. I’m sorry that I missed the evening, but I did catch the afternoon. Thank you to AKMA, Mena, and Ben!!!!! Ditto what Heather said! I especially appreciate reading the blow by blow from the comfort of my heating pad; wish I could have seen the live version, and I’m looking forward to the further conversation that seems destined to ensue. Interesting. We always enjoy your writing. Today we get a picture too. Thanks for giving all of us a good read. Thanks AKMA for hosting this, and thanks to Ben and Mena for coming out. AKMA, remind us before Jim McGee’s presentation! We wouldn’t want to miss that.